Omega-3 fatty acids are important components of cellular and membrane lipids (the chief structural constituents of living cells) essential for life and health. Omega-3 and Omega-6 fatty acids are two groups of essential fatty acids (EFAs) that cannot be synthesized by the human body. Therefore they must be ingested in the foods we eat or by supplementing our diets. 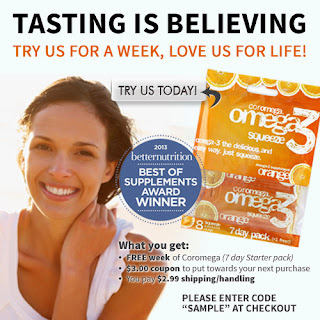 Try Coromega for the first time now! Tasting truly is believing! They invite you to sample a WEEK of Coromega for free. They feel once you try their amazing and highly effective fish oil, you will never go back to hard to swallow pills and messy oils again! • You will receive a $3.00 coupon code for your first purchase at Coromega.